Every homeowner makes it a point to look around for the best deals and products before purchasing. The same idea applies when getting a roof replacement. You need to study the manufacturers that you are considering and the warranties they offer. Every roof replacement is a serious investment. That’s why if there’s any way to prolong its life expectancy, take it. Knowing your warranties will cover various issues, including roof repair in Auburn. Some even offer problem prevention services, such as GAF. Their Golden Pledge warranty has an exclusive 40-Point Factory Inspection that ensures your roof is installed as they recommend. Warranties are an assurance tool that protects both the homeowner and the manufacturer. Before you have a roof installed, make sure you check the product features and manufacturer conditions. Ask your local contractor, such as Tedrick’s Roofing to explain the details and implications of your warranties. These will ensure that your roof will work and perform under the specific conditions stated upon installation. If it doesn’t, then request for additional assistance and support. The reason manufacturers provide warranties is they trust their product. They know the quality of their material, which is why they’re betting their reputation on it. Moreover, a warranty is a sign that a manufacturer and a contractor have full confidence in a product. Why else would they cover product defects or installation issues? Warranties serve as your silent security; all you have to do is understand the type of warranty that you have today. There are different types of warranty coverage to consider as well. The first type is one that takes care of material defects, while the other protects your product against workmanship errors. As your trusted roofing contractor in Kent, we would be happy to discuss our excellent warranties from GAF. 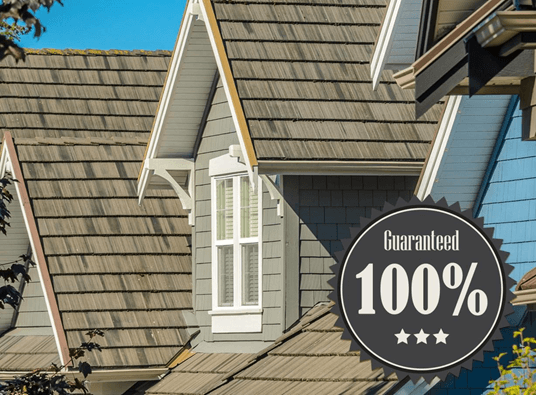 Tedrick’s Roofing offers GAF’s standard shingle warranty, better system warranty, and best Golden Pledge warranty. The warranties that we offer also come with SmartChoice® Protection Period, which covers your product against material defects during the early years of installation. Check out our Warranties page to learn more. Feel free to call us at (877) 212-9355 for more information on our products and services. We will be ready to assist you.